This is because of the way it shuts down. Instead of performing a cold boot in which everything has to be loaded, i.e. the OS kernel, the apps, etc, Windows 8 performs a partial hibernation in which the Kernel session and device drivers are saved to disk. When you startup Windows 8, it loads up from that hibernation file, which makes boot time much faster. Scroll down and you should see a box checked that says Turn on fast startup (recommended). Note that if you do not have the Turn on fast startup checkbox listed at all, it is because hibernation is not enabled. As odd as it may seem, restarting Windows 8 will first perform a complete shutdown followed by a cold boot. So those are the different ways you can perform a full shutdown of Windows 8, which comes in handy if you recently installed a new piece of hardware, etc. 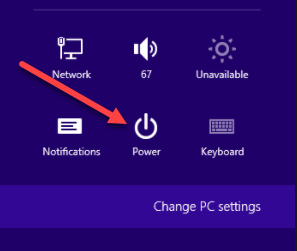 Also, just in case you don’t know how to actually shutdown a Windows 8 PC, you need to move your mouse up to the top right or bottom right corner. This will bring up the Charms Bar. Then click on Settings and then Power. Finally, click on Shut down from the list. It’s quite a process to shutdown a Windows 8 PC and one of the many reasons Window 8 failed. If you have any questions, post a comment. Enjoy!